Photo illustration by Natalie Matthews-Ramo. Photographs by iStockphoto/Thinkstock Images. Like many journalists, diplomats, and spies who lived and traveled in the old Eastern Bloc, I still have warm feelings for the Cold War. In my case, though, the sentiment precedes the time I spent overseas. In fact it dates back 50 years or so to when the Berlin Wall first went up, when I was 5 years old going on 6. This was when Boopy, our family dog, suddenly disappeared from our suburban Westchester County home. As my raconteur father explained it, the bit about Boopy being the family dog was just a cover story—a way to establish what covert operatives call “legend.” Like many Cold Warriors in the epic struggle against communism, Boopy had a secret mission. His days with us may have been few, but the tale my father told to explain Boopy’s abrupt departure gave him an everlasting, mythic sheen that even Rin Tin Tin might envy. Now, with memories of the Iron Curtain fading fast, the tale stands as a reminder that not everything associated with a “missing” pet has to be grim—and that sometimes a “true lie” might be the best way to cope with a hard truth. At the time, my father was a detective lieutenant in the NYPD leading a special anti-gambling task force. Boopy was arrested in a raid on a numbers-running operation in Harlem. Rather than put him behind bars, my father brought him home. Why my father thought it was a good idea to bring a dog with Boopy’s CV into a house full of small kids is beyond me now. Back then, apparently, pit bulls that had been providing security for bookies didn’t have the kind of reputation they have today. But my father was able to convince my mother that the dog would provide companionship and protection to my younger siblings and me. True to his breed, however, Boopy turned out to be “a lunger.” After knocking us over on more than one occasion and sending us scurrying under the kitchen table to avoid being nipped, Boopy was starting to wear thin the welcome we had extended to him. And then one day—I don’t remember how long after he first arrived, but it couldn’t have been more than a few weeks—Boopy simply vanished. Given the way he’d roughed us up, Boopy’s disappearance wasn’t entirely upsetting. Pretty soon, though, we wanted to know where he was. That’s when my father got to work, highball in hand, placing Boopy right in the middle of events unfolding on the evening news. And like the evening news itself, the true story of Boopy came out in installments, a new chapter delivered every night until the dramatic tale was told in full and our eyes beamed with pride. After my father finished briefing us on what had become of Boopy, he swore us to secrecy, making us put our hands over our hearts and make the sign of the cross for good measure. This was fine for the younger ones. But I had just started kindergarten, and I desperately needed some material for show and tell. All the other kids were bringing in neat stuff that their parents had let them take from home or telling stories about cool family vacations. (One classmate had even been to the Catskills!) Sitting there on a tiny kindergartener’s stool among my more luminous classmates with nothing to either show or tell, I was beginning to develop a complex. 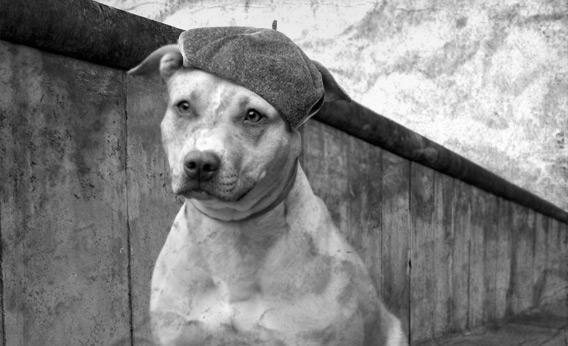 After basic training, he’d been posted to Berlin, where he’d been assigned to a clandestine wing of the Canine Commando Corps. His mission was to dig tunnels under the Berlin Wall and drag people to freedom. According to all reports, he was doing a fantastic job. So fantastic in fact that Kennedy gave him a medal for it—and then gave him a second medal after Boopy went up to Nikita Khrushchev at the award ceremony and peed right on his leg! With my sense of geopolitics being a bit underdeveloped at the time, the idea of the Soviet premier being at an American military decorations ceremony didn’t seem odd. It didn’t seem odd to my kindergarten classmates either. After I told them the story, we marched around the classroom (well, at least the boys), waving a flag, hailing Boopy and his critical role in our impending triumph over the Red Menace. Soon, we wouldn’t have to cower anymore in the basement bomb shelter waiting for the “The Big One,” as the older guys called it as they smacked their fists into their palms. My teacher Mrs. Fath, however, did shoot me a somewhat dubious look. Sensing she might be less than convinced, I told her that my story about Boopy had to be true because my father had told me the story and he’d been in the Navy in World War II and he was a police officer now and he can’t lie because he could lose his job if he did. She let it go. After a while, news from the front about Boopy faded, as did my curiosity about his fate. A year or so after Boopy had deployed, however, his memory was revived when President Kennedy went to Berlin. Sitting in front of the black-and-white television as Kennedy gave his famous speech, I listened intently for some indication Boopy was still alive but wound up disappointed. Relaxing in his armchair, my father told me not to worry. Kennedy was speaking in a secret code that only he and Boopy could decipher. When the president said “Ich bin ein Berliner,” what he was really saying was “Keep up the good work there, pooch.” Then my father raised a glass in Boopy’s honor. Meanwhile, the evening news cut to footage of German shepherds patrolling the barbed-wire no man’s land near the Berlin Wall. They looked ferocious, capable of ripping apart anyone trying to escape. But I knew that Boopy could run rings around them. Dig tunnels underneath them, too.